Trying to rival YouTube, Facebook has been pushing towards better Facebook video engagement and promotion for the past couple of years. In an attempt to help you out with your branding efforts on the platform, we wanted to have a look at the state of Facebook video in order to give you insights into viewing behaviour of the Facebook audience. For this video study we looked at 1,000 Facebook pages via our Facebook video insights Locowise analytics tool. The pages has a total of over 291 million page likes. These pages uploaded 5,800 native videos and got 182 million total views. Let’s take a look at a look at our top 17 Facebook video facts that we’ve managed to find with our findings and the insights you can use to improve your own video activities. The first surprising discovery is that 47% of the 1,000 pages we looked at didn’t upload any videos. There’s been so much buzz about video on Facebook and on the Internet in general. And even on this blog we’ve shown how you can boost your organic reach by uploading videos, but still almost half of the pages do not do video. What is stopping brands from getting into video production? Part of the reasoning might lie behind the difficulty of producing video content, as noted in our Facebook video production with free tools piece. Your lesson to learn here is that if you’re actively producing video content you are already well ahead of many brands. If not, it’s a great time to get started as you’re not behind much, yet. 527 video-active pages from our study uploaded almost 5,800 native Facebook videos combined in the month. A more telling number is that 33% of the active pages only posted 1 video each. 14% of pages posted 2 videos, 11% posted 3, and 7% posted 4 videos. 16% posted between 5 and 9 videos in the month while 12% posted between 10 and 29 videos and 4% posted between 30 and 99 videos. By posting just 2 videos your brand would have been in the top 35% of all pages. As said earlier, you are definitely not behind much and have a great opportunity to get ahead by creating a video content plan and a budget today. 12 brands posted more than 100 videos each. In percentages that’s 1.2% of the 1,000 pages in this study or 2.3% of the 527 pages that did upload video. These 12 brands posted 46% of all the videos that the 1,000 pages uploaded in our selected period. These are the 12 video heroes in our study. Maybe not so surprising is that Red Bull is in the lead with 400 videos uploaded in the period of our analysis. Do visit these pages, explore their videos and get inspired for your own video efforts. One of the reasons why some content creators stay away from Facebook video is that they cannot monetise Facebook video like they can on YouTube. Yet, the transition we can already note with brands moving away from YouTube and posting more active content on Facebook video with the new video monetization program introduced by Facebook in 2017. The controversies surrounding some of the biggest YouTube creators didn’t help the video platform as well. In fact, after the boycott, you could see efforts from YouTube creators and other online influencers transition their content towards Facebook video. Facebook also intends to expand its monetization towards other countries, which might largely affect the popularity of the Facebook video platforms. Currently, the eligible publishers monetization program is primarily available in the U.S. market. However, soon content creators from all over the world will have the revenue share on top of the access to the large Facebook audience and the 4 billion daily views. This will remove the last hurdle and there won’t be many more excuses left for you to ignore native video format on Facebook. The pages that we looked at in our study got just over 182 million videos views in total. The average number of views per video was 38,113 and this was 7.8% of the total page audience. Remember that a “video view” on Facebook is defined as a view of three seconds or more. Facebook videos are autoplayed in news feeds and all views are counted, including those that come to life as people scroll through their news feeds. Are these videos affected by banner blindness-like symptoms with people tuning them out completely? How many of your video views are actually people watching your content? “View” might not be the most accurate metric to judge the viewer interest from so let’s dive into it a bit deeper. The average length of a video was 55.3 seconds. The average view duration was 18.2 seconds, which means that people watch only a third of a video on average. In their efforts to compete with YouTube Facebook has also introduced a float button that allows users to click to watch the video anywhere on the screen as they’re scrolling further down their feed. It will be interesting to see if this will have any effect. The takeaway for brands is that many people don’t spend much time watching videos. Might it be because of the autoplay? These videos start playing in news feeds as people scroll through, and there could be a number of reasons why many people are neither willing nor ready to engage with them on a deeper level. Your challenge is to get people to keep watching. Do keep your videos relevant, interesting and as short as possible. Preferably under 30 seconds. Under 20 seconds would be even better. A “Clicked-to-play” registers after a person has clicked to play a video sound. 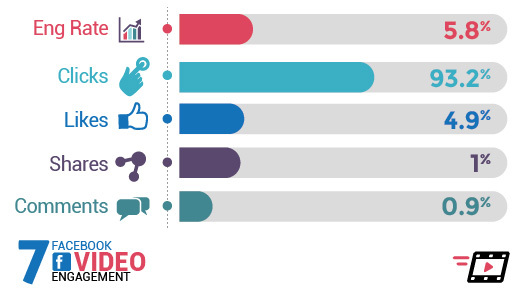 These views are more meaningful for brands in order to determine the interest and engagement there is on their videos. Users actually need to click to play the video with sound which is a strong sign of content relevance and interest compared to the default autoplay view figure. It looks to be that the vast majority of video views on Facebook come from people scrolling through their news feed. They might see some 3 seconds of your video but they don’t hear the sound nor do they take any action in order to engage deeper with the video. Let’s also look at what Facebook calls “30 seconds views”. “30 Seconds Views” are the number of total views which lasted at least 30 seconds or to the end of the video, whichever occurred first. We can conclude that videos shorter than 30 seconds are viewed for longer. Further, they also get a larger number of people clicking on them to turn on the sound compared to the average video. 41.3% of the pages used Facebook paid ads to promote their video content during the period. 7.3% of all video views were paid for through Facebook advertising. These numbers are similar to the numbers of pages using Facebook advertising to boost their content reach (43.36% in in the prior analysis period), and show that advertising is popular even for video content. A view may be only 3 seconds but a “complete view” metric on Facebook means that a minimum 95% of the video has been watched. This number shows more accurately how compelling your video is with the audience that views it. These numbers do suggest that even though you may be able to pay for views, only a third of paid views actually end up watching 95% or more of your video. Paid views are less likely than organic views to finish the full video. This might be the reason that Facebook is introducing the option for advertisers to pay per video view only after 10 seconds have been watched. Right now advertisers are paying for all views, including those that just scroll past the video in their feeds. The average engagement rate (likes, comments, shares, clicks) for Facebook videos was at 5.8% of page likes reached. Most people are silent engagers. 93.2% of all engagements were clicks. Only 4.9% were likes, while 1% were shares and 0.9% were comments. This explains why Facebook announced changes in the way their algorithm determines which videos will surface to the top of news feeds. It’s no longer only about likes, comments and shares. Actions people take on videos such as turning on sound, turning the volume up, enabling high definition or making the video full screen are now part of the algorithm. This is on top of recent changes that incorporated video views and the time spent watching the video into the algorithm. “We do not expect most pages to see significant changes in distribution as a result of this update”, Facebook said, but for pages that are actively uploading native video this will certainly make a difference. What are the key takeaways brands can learn from this? You could beat your competitors and get extra reach by making and uploading optimised videos. What are you waiting for? The ideal length of a video is 30 seconds or less. Keep your videos short. Most videos are viewed via autoplay only. Have an inviting thumbnail and work on attracting your viewer in the first few seconds to get them curious enough to click-to-play sound. You videos should make sense without sound too. Add subtitles. Include a narrative story within your videos in order for people to understand the video even if they’re seeing it without sound. Is YouTube your main video platform? Don’t lose out on the Facebook’s potential. Share short, teaser videos natively on Facebook with calls-to-action to watch the full video on YouTube. We hope these Facebook Video facts have inspired you to pursue brand video content far more passionately. For practical insights into the performance of your Facebook videos, do take a look at Locowise’s free trial now.